Spring has finally arrived, and it is time to start thinking about what to wear this upcoming season. Below are my wardrobe suggestions for your spring trip, a day at the office, a casual weekend, or a night out. For the last couple of seasons, the midi skirt has made a comeback. Nothing says spring like a seersucker midi. When you are wearing a skirt that has more volume it is always good to pair it with a top that is more form fitting. This tank bodysuit from J. Crew is perfect! I love a bodysuit with a bottom that is loose and flowing. This outfit is truly all about the accessories. The yellow earring and yellow slide make it fun and sunny (like spring), and this tan tote is a perfect carry on! The bag is Sophie Hulme, a British designer who has amazing structured bags. Pastels are another big trend this season. Why not give pastels a try at the office? This pink Theory wool blazer is the statement piece, so I kept the pants and tank simple. The large hoops are Jennifer Fisher. If you see a celebrity wearing hoops, they are probably hers. Getting dressed should be fun, and nothing is more fun than these pink “Boss Lady” heels. They are Sophia Webster, another British designer, known for her whimsical shoe designs. Update your weekend look with a stripe. 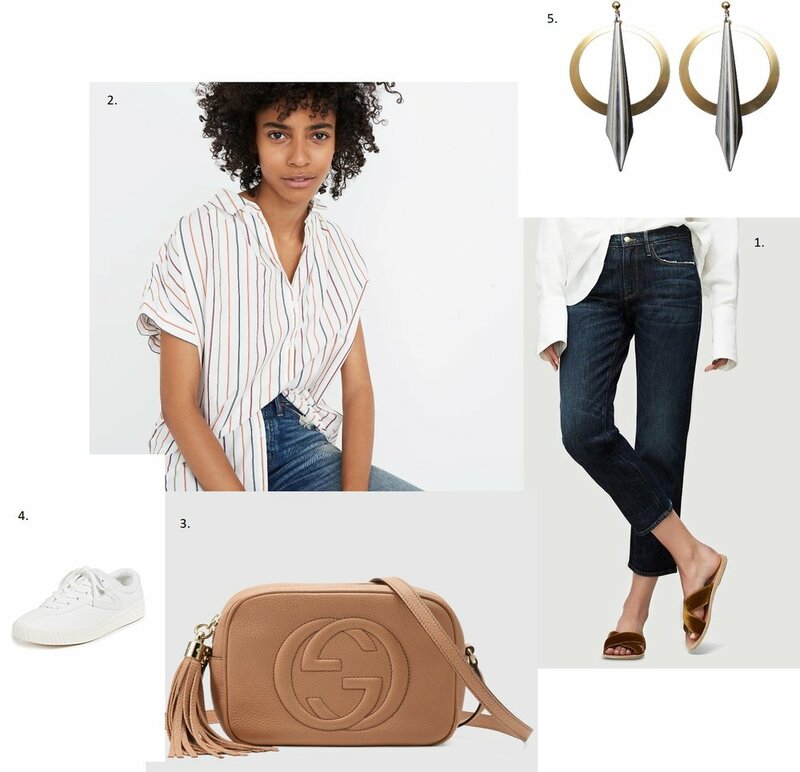 This Madewell striped short sleeve shirt can be worn a few ways. Try it with a full tuck, a front tuck, or tie it at your waist to give definition. When it comes to jeans, there are so many denim fits to choose from right now! There is something for everyone and for every shape. I love these Frame cropped straight leg jeans for summer. The dark wash is a current trend and the straight leg feels fresh. Pair it with the classic Gucci camera case and these Honey Rose & K mixed metal earrings. Tretorns are back and are a great spring sneaker option! This spring try pajama pants for a night out. They are so comfortable you may not want to leave the house. Just like the travel outfit, I am pairing this loose bottom with a bodysuit. 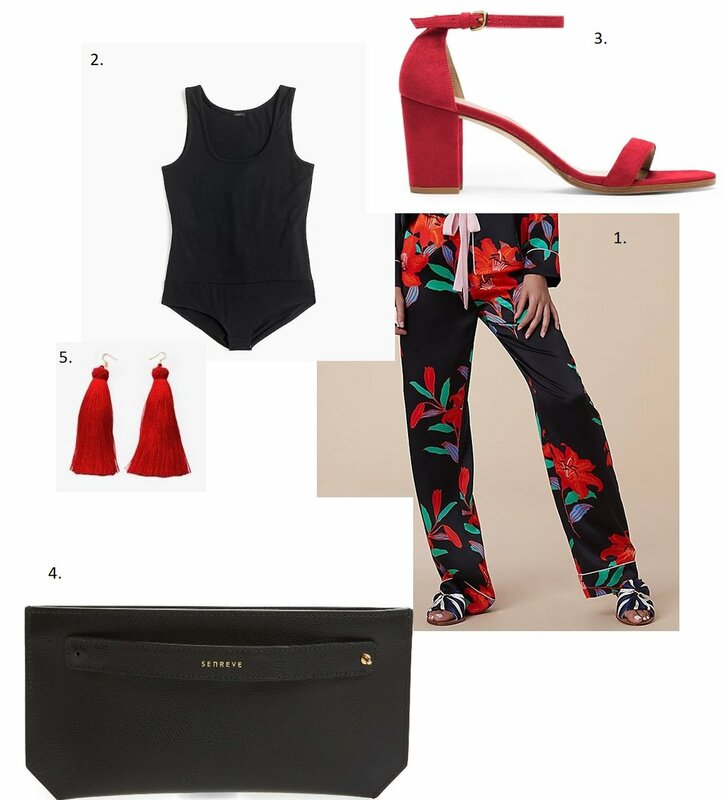 The red tassel earrings and red suede heels turn it from a pajama party to Saturday night fever! Keep your bag simple with a black clutch. Remember to book a styling appointment for all of your wardrobe needs this spring season!